As I've explored on Who What Wear before, moving in with your S.O. can really change your whole closet organising game. Suddenly, the amount of clothing, shoes, and other accessories in your house has doubled, and all the work you previously invested in keeping your stuff just so goes kaput. Well, I also recently had the joyous experience of teaming up with the S.O. in question to organise our overflowing closet, and I discovered that the project actually isn't as overwhelming as it can seem—and the results are beyond rewarding. (It just feels so good to look at the former mess you've turned into a neat pile, doesn't it?) We spent a relatively modest amount of money, investing in just a few key pieces that have upgraded the setup of both our wardrobes. As a woman with a lot of jewellery, I don't find anything as infuriating as a chaotic mess of tangled necklaces and bracelets. 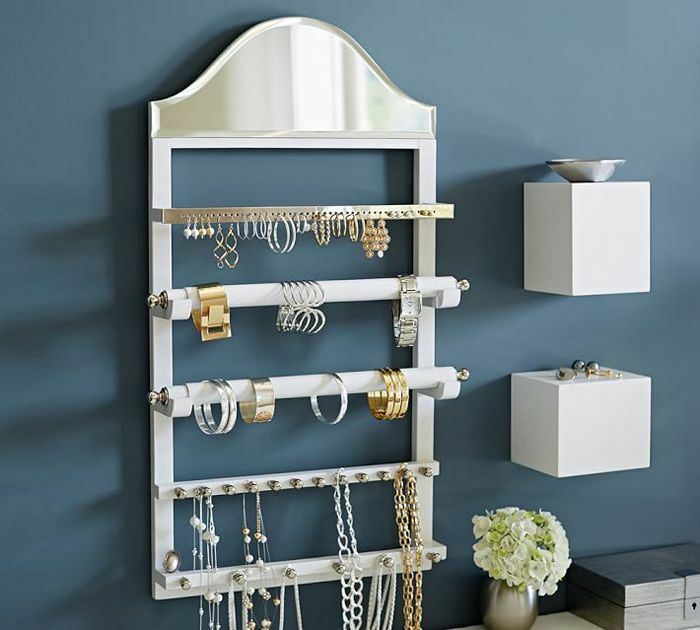 Every woman needs a way to organise her jewellery, and this Pottery Barn pick is just as lovely as it is useful. About halfway through our organisation project, we both admitted defeat: We simply didn't have enough room for all our stuff in one closet, and we needed an additional way to hang things. I love this garment rack because it has a top shelf (for my dude's hats) and a shoe rack at the bottom, and it's extendable up to 71 inches! What is YOUR secret for a super-organised closet? Tell us in the comments below!